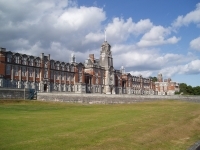 Britannia Royal Naval College will be open to visitors between 1100-1500 on Saturday 27th July 2019. The Plymouth Royal Marine Band will open the proceedings and during the day there will be a varied programme of music on offer culminating with Ceremonial Beat Retreat at 1500. There will be a variety of static displays including Ribs and Gig boats, and the challenge of a climbing wall. There is to be Commando Troop unarmed combat display. Hot and cold refreshments are available throughout this family fun filled day and guests are requested not to bring picnics on site. It should also be noted that no pets, other than Guide Dogs will be allowed in on the day. For those a little less agile a minibus shuttle will run from the main gate throughout.